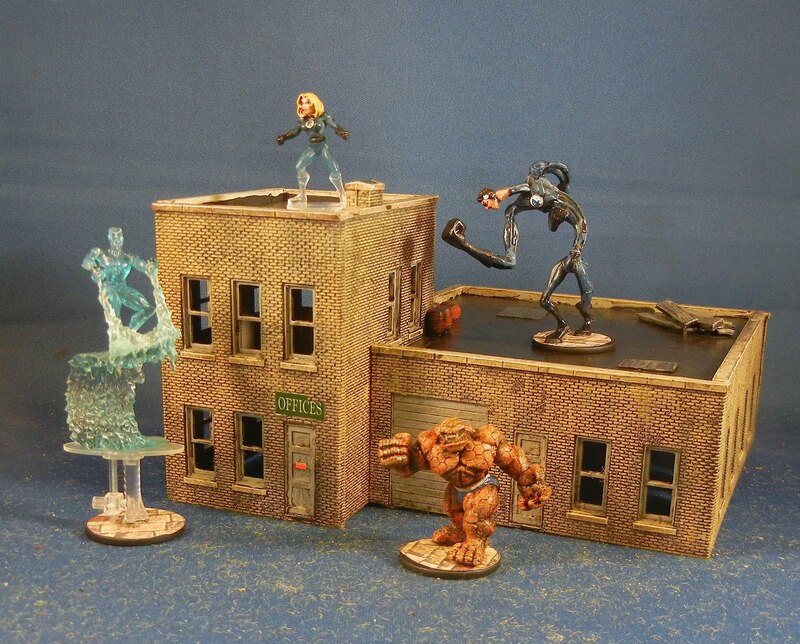 While working on some Malifaux figures, I took a break and built an HO building for the upcoming Power Legions rules. This is supposed to be a taxi cab company but will serve as a generic warehouse in the heart of old Gotham. It needs some more detail on the roof--maybe a bill board or HVAC system or water cistern. Clearly the Thing is not happy to read the door is for employees only. Up next: I finished painting and washing some hill-billy goblins. Just need to base them (perhaps tonight) and then I'm onto some bomb-toting pigs and some saloon girls. Bruce and I both ordered the full Maurice rules on the weekend and got the pdf in our inboxes to tide us over until the hardback rules are ready. 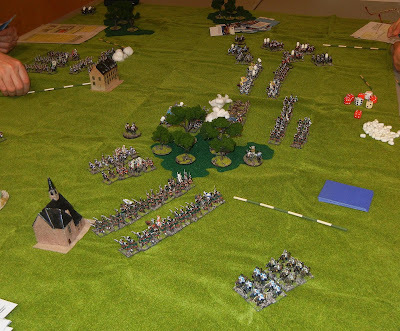 We decided to give the full rules a go with an Austrian v Prussian game last night. 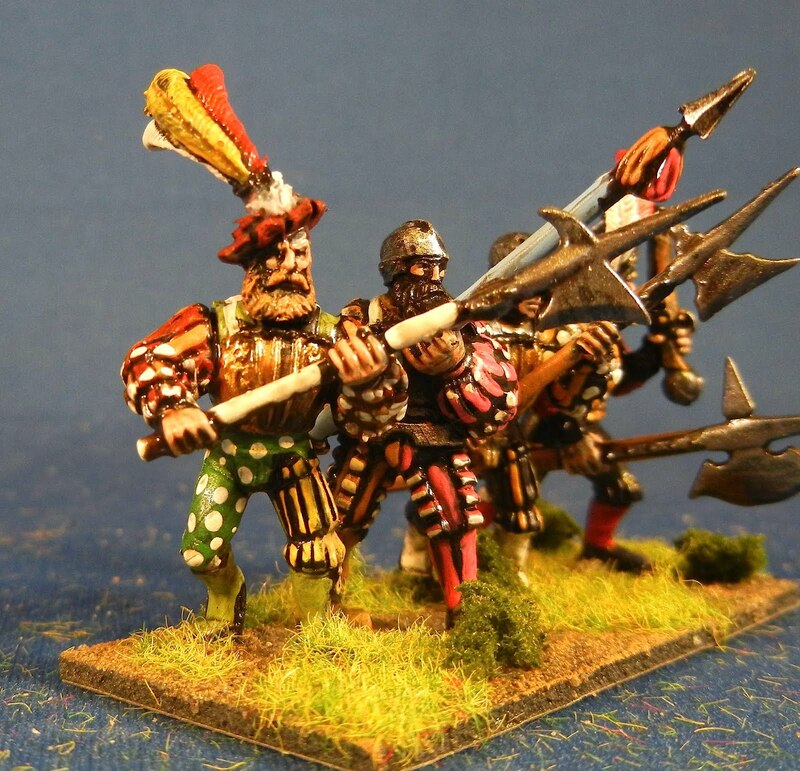 Bruce trotted out some new Zuzzy hills he'd bought and painted and the promptly entrenched his Austrians upon them. I entered from the left of the shot. I decided to stay in column and throw a cavalry probe around behind his lines to see if I could bag the camp he'd set up. 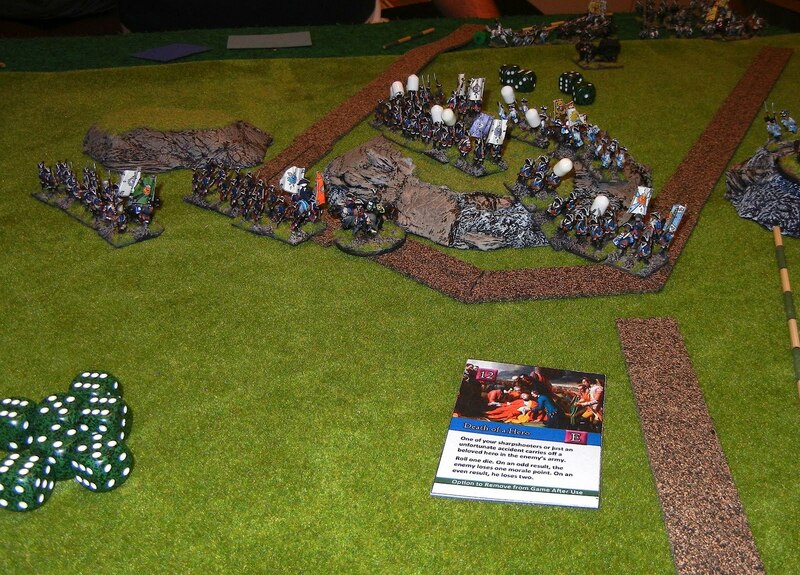 No such luck as he met my cavalry with his own and then threw a unit of foot onto the flanks to pick me to pieces. What a trouncing! I figured the game was over but decided to spring part two of my plan anyhow. So I deployed the Prussian into a long line overlapping the right side of his line and sent them forward. I managed to brush off a couple of cavalry units at the cost of a cannon and a foot and then my luck got hot. Things were close, however, as I was within one unit of losing the whole time. 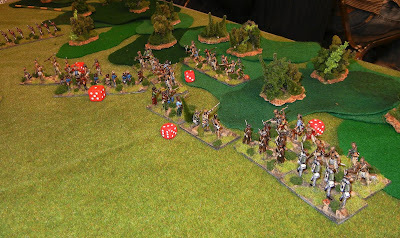 There was a lot of frantic rallying as I mounted the hill, turned his line and surged forward to bag a unit, which brought him within two points of breaking. Then I played (for the second time that night) a "sharpshooter" card which caused him to lose two morale points and his force to break. Bruce was very gracious in defeat, given he had completely out played me all evening. All told, the full rules played well and the changes improved the game, I think. I am keen to see the rest of the cards and rules and us a few more minor nobles to get a sense of the thicker command system. Boy, having a captain who can move 4 base-widths each turn for free is a huge advantage. 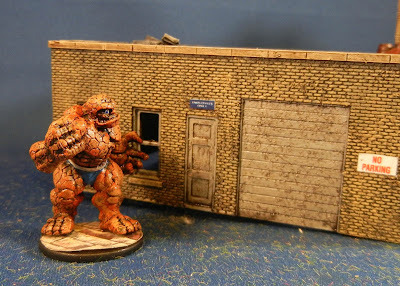 Up next: I have some 28mm hill-billy goblins and small 1/72 warehouse on the go. I finally managed to work my way through five bases of 28mm renaissance halberders . 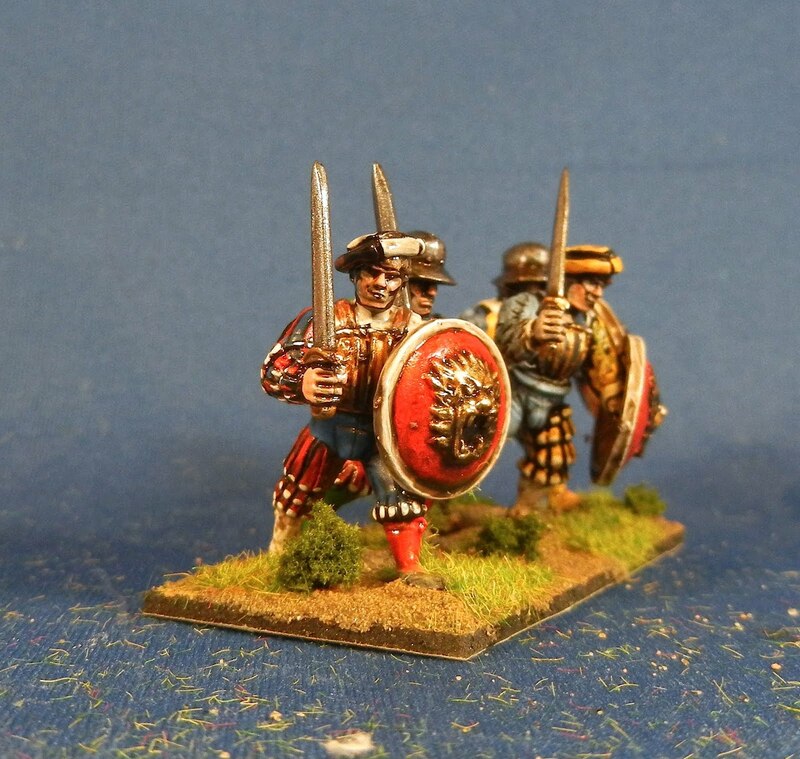 These are GW Empire troops that I got in a job lot. For some reason I only took pictures of four of the bases. Oh well! I was happier with how these guys turned out than the last batch of renaissance. I spent more time varying the colours and patterns, although there are a lot of stripes (nature of the sculpts). I think GW did a very nice job putting character into these faces. As a job lot of bits, there was a lot of mix-and-matching here. Not sure where the pirate head came from--perhaps it is standard GW issue? I have a couple more boxes of renaissance foot to work my way through. 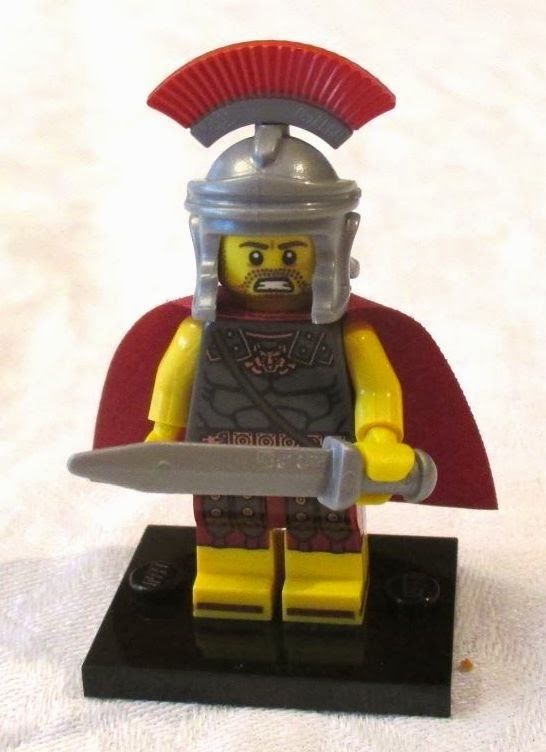 I will likely do them up in a more uniform manner as if they were the troops of a particular noble or city. 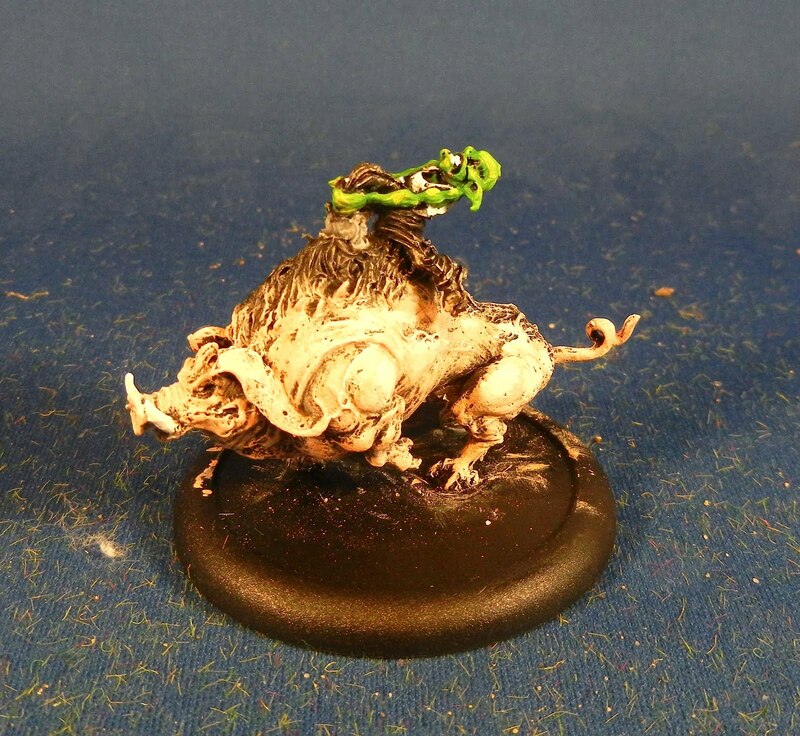 Up next: I have a bunch of 28mm Malifaux that I am working through and quite enjoying. I hope to have the hill-billy goblins done by this weekend and then onto the second group. This is the third Maurice scenario Bruce McFarlane asked me to upload. The 1745 Jacobite rebellion stumbled to a halt, at Derby. The English Jacobin supporters had failed to materialize, as had the prospect of a French invasion. The Highland army returned to Scotland and laid siege to a small force under the command of Major General Blakeney , within Sterling castle. 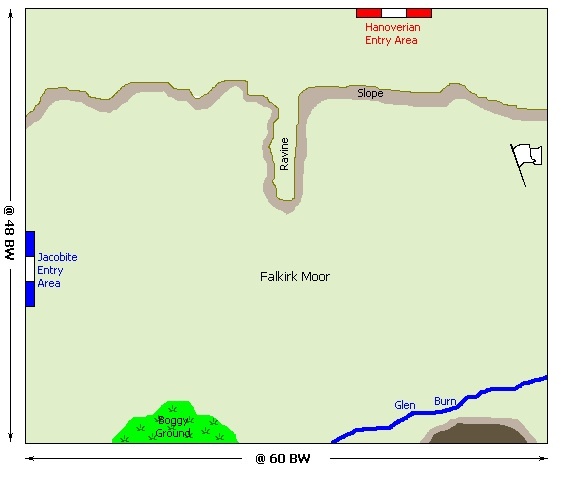 The regular Hanoverian, army under General Hawley, marched from Edinburgh to Falkirk intent on releaving the besieged garrison. On the morning of 17 January, the Jacobites planned an offensive. Avoiding the main road they mounted Falkirk Hill, intent on attacking Hawley’s camp, adjacent to the town of Falkirk. At 1 pm Hawley was informed of the Highlanders’ approach, but refused to believe the intelligence. At 2 pm, with the Jacobite attack imminent, Hawley finally realized the seriousness of the situation and galloped into the government camp. 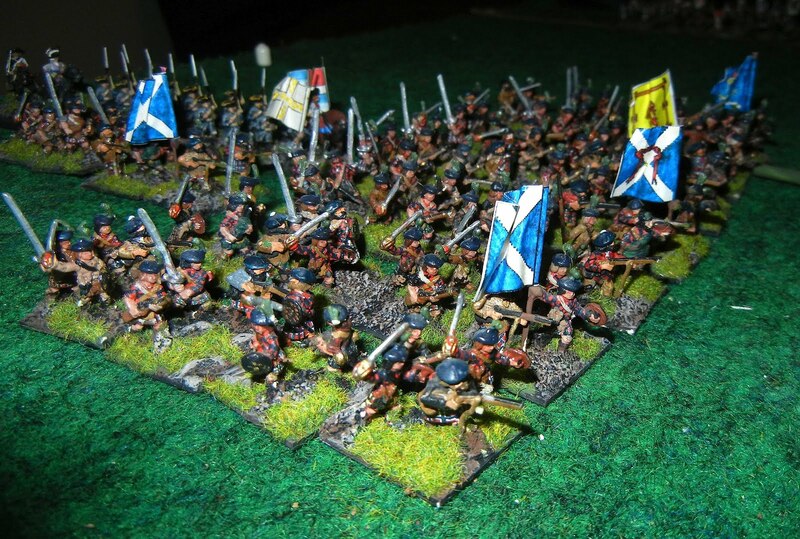 The army was roused and sent onto the Moor to block the Highlanders’ advance. The battlefield 60 base-widths wide and 48 base-widths tall. 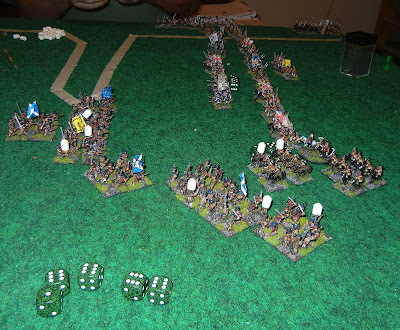 The Jacobites are the attackers and start the game with 8 cards. The Hanoverians are the defenders and start the game with 8 cards. The battle was fought during a terrible storm. As a result the maximum hand is limited to 8 cards. 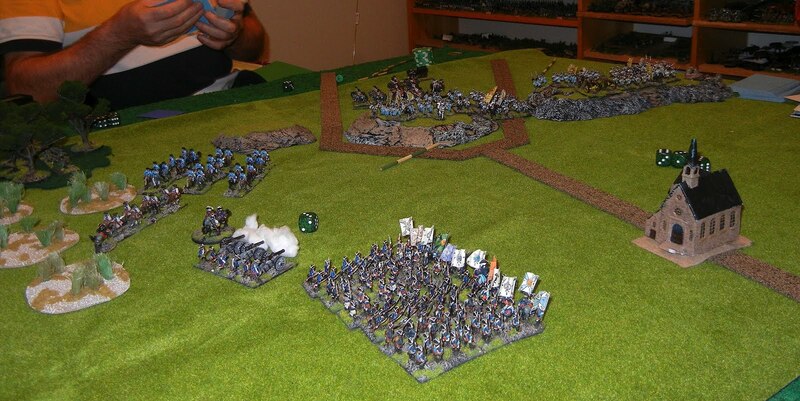 Both armies start off-table. They may enter on turn one, in any legal formation, at their respective entry areas. This is the second Maurice scenario Bruce McFarlane asked me to post for him. Without winter clothing, the British suffered through the harsh Canadian winter. Survey and malnutrition thinned their ranks. In spring, General de Levis returned with a rejuvenated French army. The Battle of Ste Foy was a virtual repeat of the Battle of the Plains of Abraham that took place in 1759. 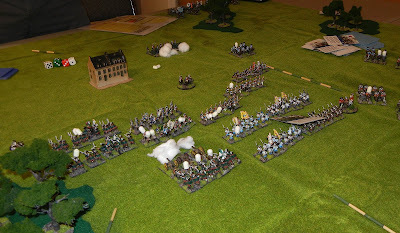 The attacking French sent the British into a rout. They took refuge inside the walls of Quebec and waited for relief. The fate of New France would hang on which navy made it up river, after the spring breakup. 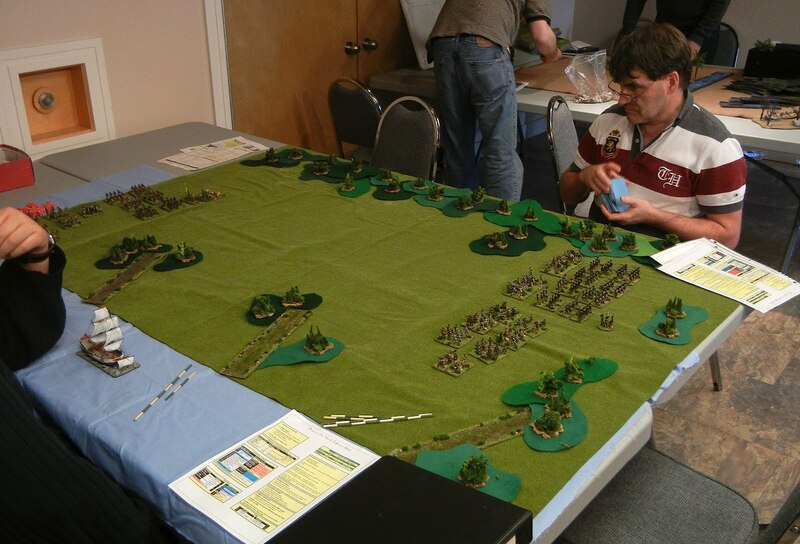 The battlefield is 40 base-widths wide and 46 base-widths tall. There are two escarpments on the battlefield denoted by grey lines at the top and bottom of the map. Both are impassable to all troops, except via a road. The French are the attackers. They begin with eight cards. The French set-up in the blue French Deployment Zone on the left side of the map. The British are the defenders. They begin with six cards. 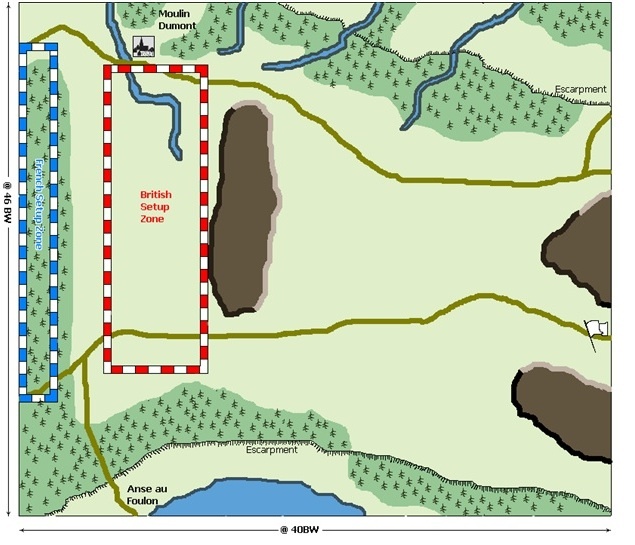 The British set-up in the red British Deployment Zone in the middle of the map. The British had suffered through a Canadian winter. Malnutrition and scurvy had thinned their ranks. 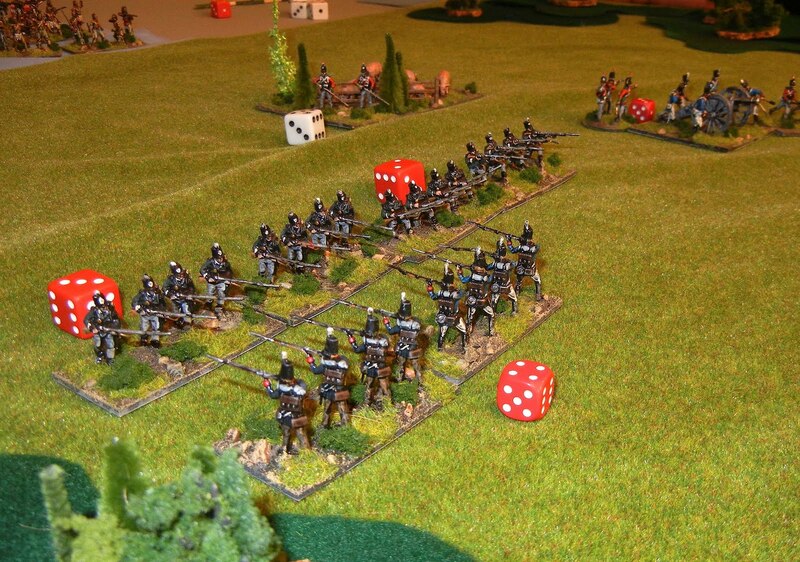 Before the game roll a die for each Regular battalion in the British army. On a roll of “1” or “2” the battalion is reduced to “Conscript” status, for the entire game. 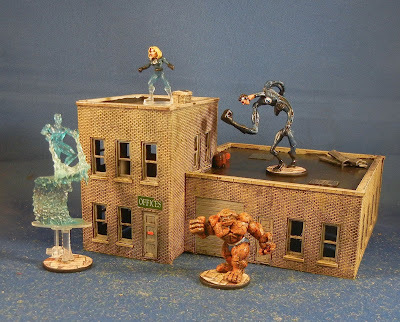 Bruce McFarlane asked me to post this Maurice scenario on my blog for those who were interested. Bruce has sent me two more scenarios that I will upload later this weekend. After spending all of the summer of 1759 in fruitless attempts to land on the north shore, General Wolfe opted for a desperate plan. On the evening of September 12th the British fleet embarked the army and sailed up river towards the landing site at Cape Rouge. After midnight, however, the fleet drifted back down river and disembarked the troops below the cliffs of Quebec. French General Marquis du Montcalm felt he had no choice, but to attack immediately. At 10:00 am, he gathered less than half the available French troops and headed out onto the Plains of Abraham. The British waited in their usual “thin red line”. Wolfe had ordered every man to load their muskets with double shot. The single thunderous volley, set the French line to in disorder. Some claim the British advanced 40 yards and unleashed a second volley. 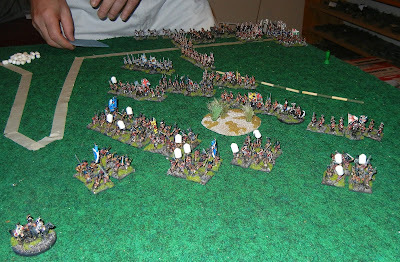 Others claim the highlanders charged the French line. Whatever the cause, the French routed – Montcalm mortally wounded. On the British side, Wolfe lay dying. Governor Vaudreuil gathered the remaining French troops and withdrew to Montreal. They would return in the spring. The British are the defenders. They begin with eight cards. They start in the red British Setup Zone. The French are the attackers. They start with eight cards. 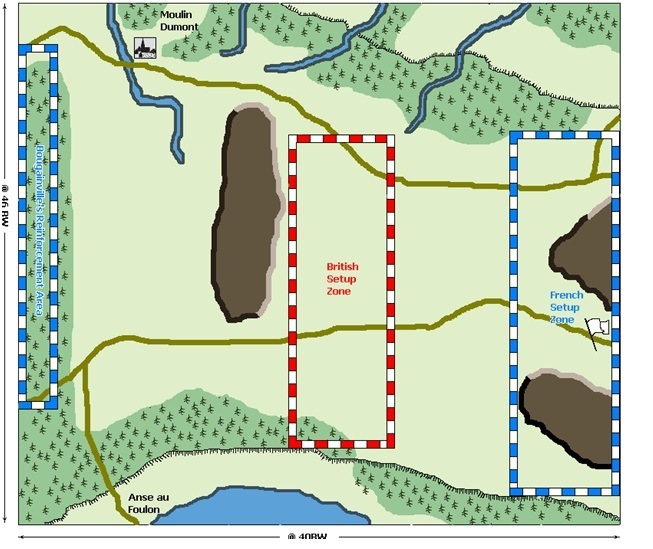 All the French regular troops (minus Bourgainville’s troops and Vaudreuil’s troops) start in the blue French Setup Zone on the right. 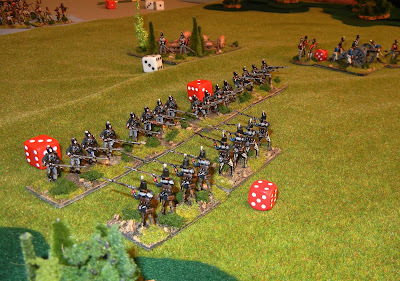 The two French Irregular battalions can start within any wooded area of the battlefield. Only the French player receives reinforcements. After the “Reshuffle” card has been added to the deck, the French player rolls a die at the beginning of each of his turns. 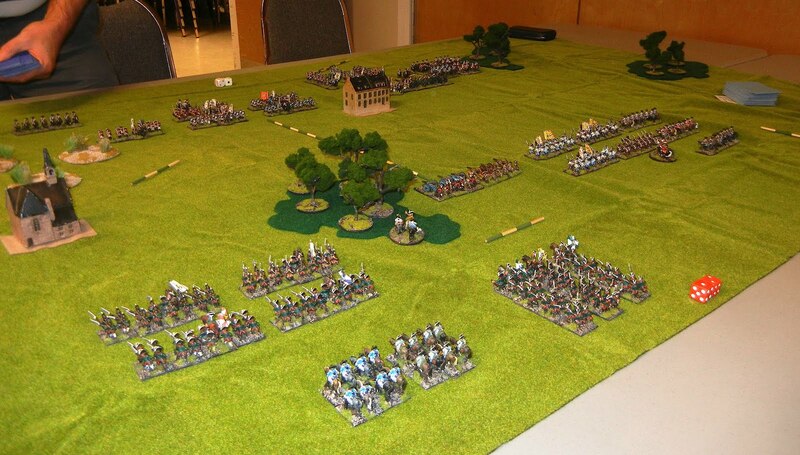 On a roll of “5” Governor Vaudreuil arrives with his troops and deploys in the “French Setup Zone”. On a roll of “6” General Bourgainville arrives with his troops and deploys in the blue “Bourgainville Reinforcement Area” on the left side of the map. Bourgainville’s troops are considered as a separate army from the main French force. Bourgainville starts with 4 cards and has a maximum hand of 5 cards. 1. What if Montcalm had waited until all his forces had gathered and attacked at noon? 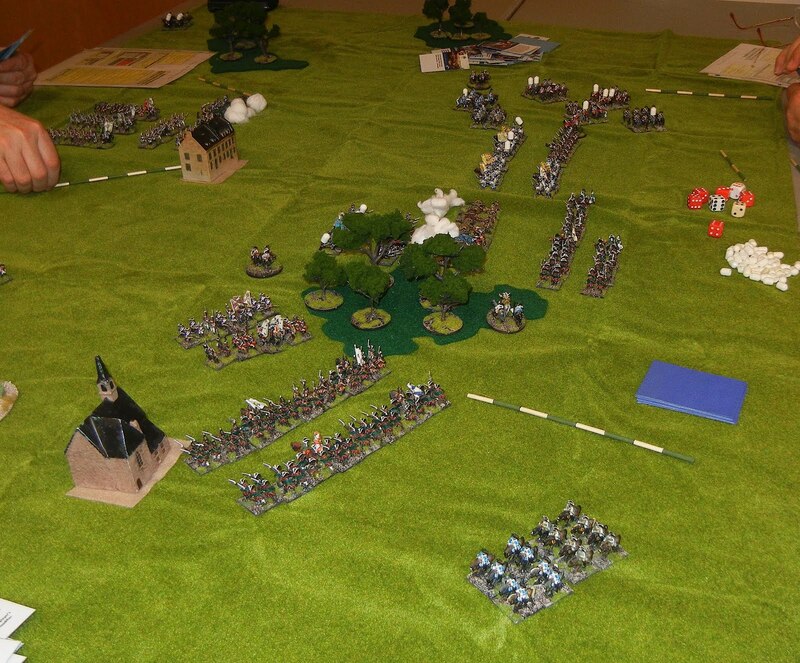 Vaudreuil’s troops start the game within the French Setup Zone. 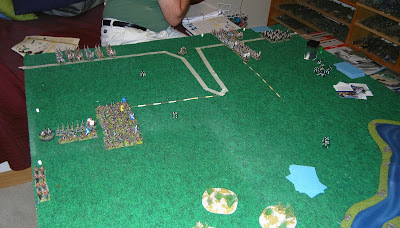 Bourgainville’s troops start the game within the Bourgainville Reinforcement Area. 2. What if Montcalm had attacked the British at first light, before they had fully deployed upon the heights ? The British Setup Zone is relocated to anywhere within 12 BW of the Anse au Foulon. Army Morale: Half of units in army. 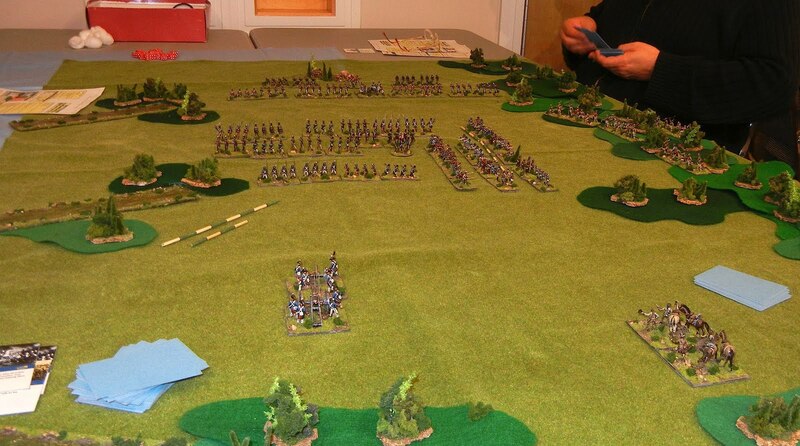 Bruce and I hosted a game of Maurice last night, using Chrysler's Farm as the War of 1812 scenario. Maurice is not meant to go that late but we thought wed give it a try anyhow. We added in a gunboat and guessed at the rules of irregulars (Indians). The gunboat acted like two cannons, activated any time the British player declared a bombard with any cannon and was activated to move by march orders with any card (no distance calculation). If the gunboat was within 4BWs of the enemy, it could also engage in firefights. 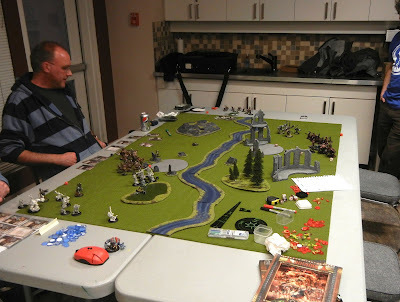 The picture below shows the battlefield before things began. The British are at the far end, protecting a geographic point (represented by a pig pen you can just barely see in the distance in the photo below). The Americans could win by occupying the pig pen. The British could win by killing 10 (of roughly 20) American units. 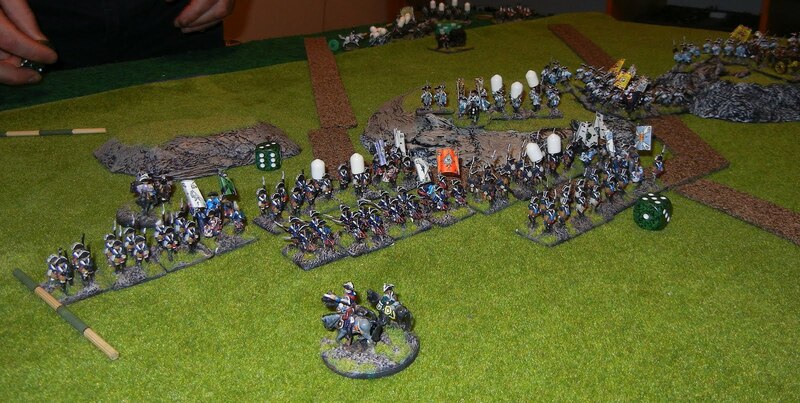 The British regulars (4 units), elite (2 units) and cannon (2 units) started anywhere up to 1/3rd of the way in. The British Indian allies (4 units) and up to one of the regular foot could start 2/3rds of the way into the board. The gunboat could start anywhere. 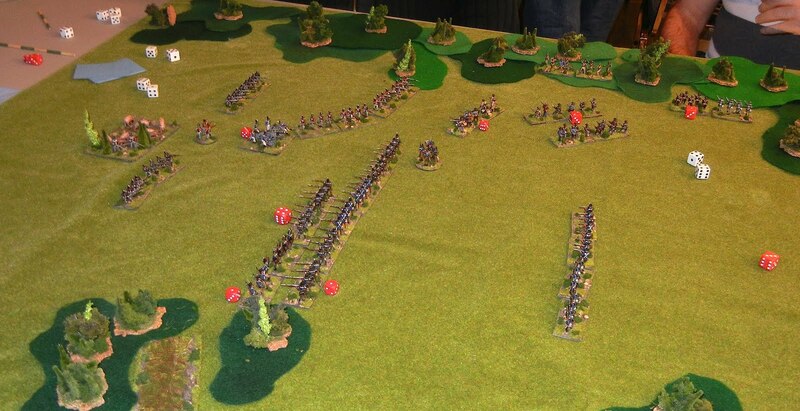 The Americans (8 regular, 7 conscript, 4 cannon, 1 dragoon) started anywhere up to 12 inches from their edge (foreground). 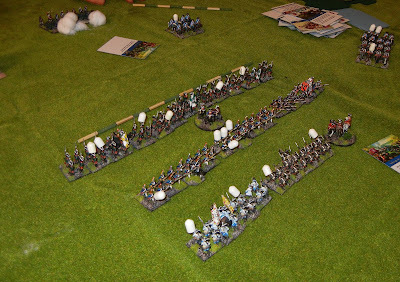 Americans rushed up the board in column, leaving their cannon and dragoons behind. This would be a problem later on! They then formed line but did so too far apart to have the lines move together! As a post AWI option, we might want the ability to come out of line forward or to move in mass (attack column style)--fairly easy things to work into the rules. 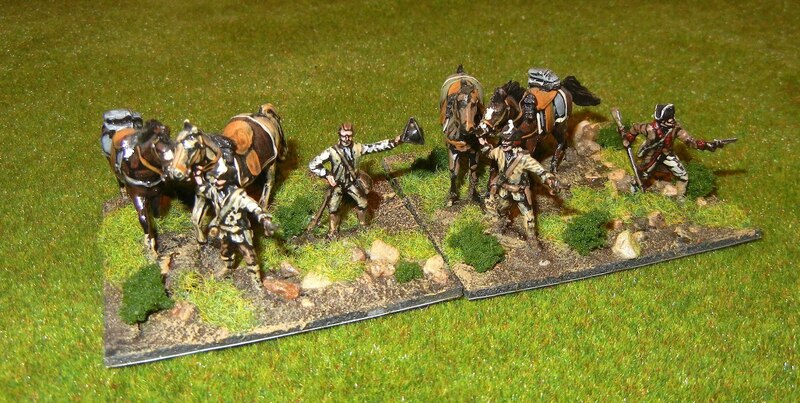 Here, the American dragoons are chopping at the bit. 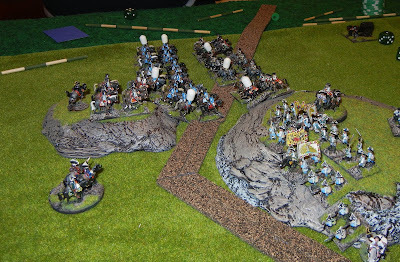 They never did see action, but did a great job of holding down the flank. While Scott annoying held up the main American advance, Guy sprung his Indians out of the woods and onto the American militia. Bruce gamely fought him off but there were lots of casualties on either side. 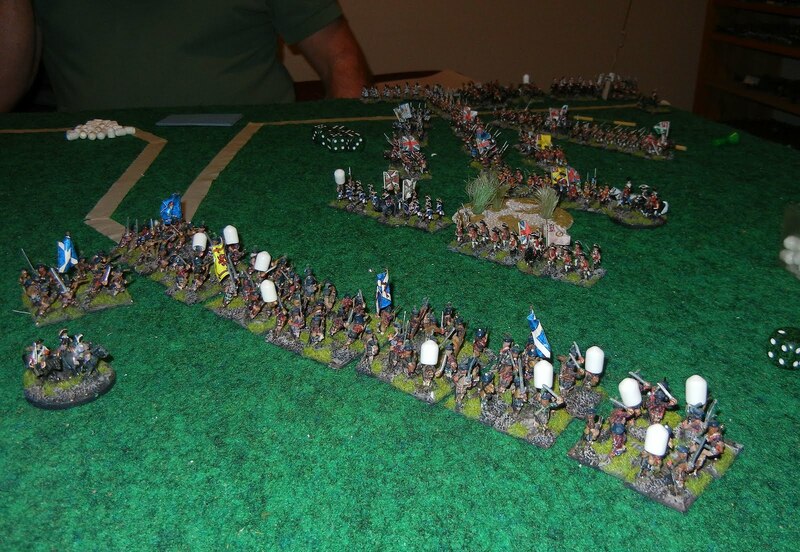 Eventually Bruce stabilized the American flank and we turned to move forward to take the pig pen. We bagged a couple of units of British regulars but then ran into the meat grinder of the British grenadiers. It was horrible! Even with Scott's terrible rolling he chewed through unit after unit. Eventually, attrition told and the Americans were forced to withdraw. A historical outcome! This was the third set of rules I've played this game with and I think this was the best play through. The preliminary stages went quickly (a fast march up the table), the Indians jumped out of the woods and put the hurt on the militia before breaking, and the British regulars and grenadiers beat the snot out of the boys in blue. All managed in about 2 hours, including rules explanation. 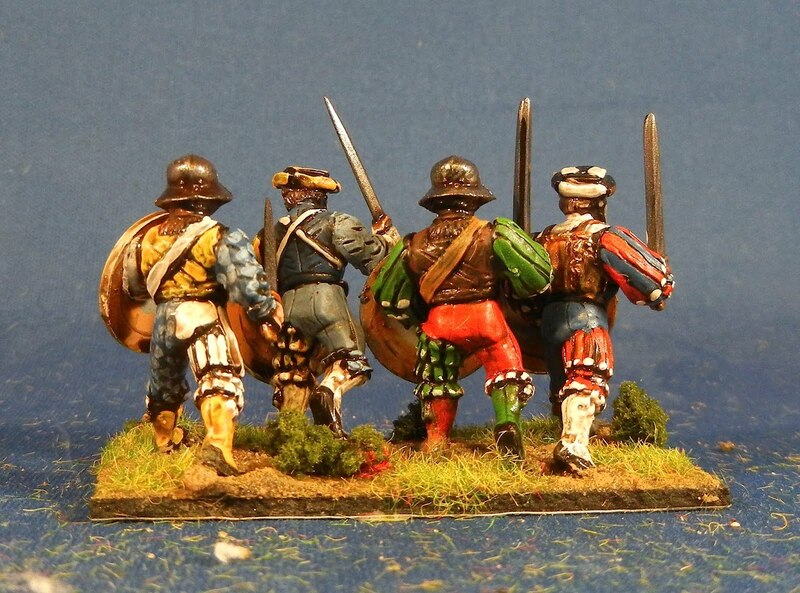 Up next: Some more 28mm renaissance. It was been a slow week gaming-wise, with some distractions at work and in the garden. I've also been prepping a War of 1812 game of Maurice. But I have been putting in a few minutes a day at the painting table. While there are a couple of dozen more renaissance figures in various stages of painting, these four swordsmen were ready to base so I finished them to show some progress! These are GW empire figures I got in a job lot. Nice enough figures with no particular historical paint scheme beyond "really festive". I've also been working on a Malifaux commission. I have built some hill-billy goblins and am just starting the painting. Last night I told my wife I would "be there in a minute, I'm dry brushing some pig flesh while trying to avoid the dynamite" so I thought I would show WIP. Nothing special--just have the basic flesh colour blocked in but the sculpt is hilarious. Up next: More renaissance and hill-billy goblins plus a game of Maurice at the club (Battle of Chrysler's Farm). Bruce hosted our usual "off-Tuesday" game and we again had a go at Maurice. 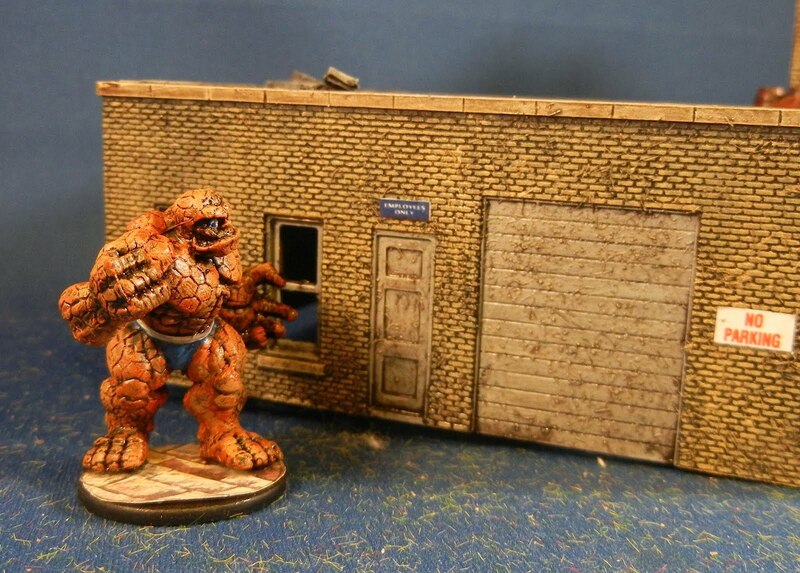 This time Bruce hauled out a Scottish scenario (Falkirk?) with both sides being forced to deploy on the board. The masking tape point in the background is a ridge-line that is bad going. Scots are on the left, British from the top. This was the first outing for Bruce's rebased highlanders. He allowed them to form mass and gave them a plus 1 on melee but they shot with only two dice in mass and hit only on a 5 and 6. This means these pretty much have to come to blows quickly or they will be shot to pieces. 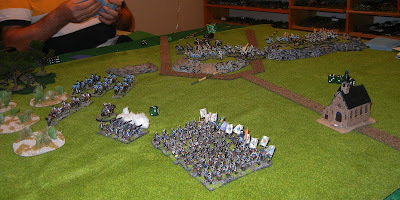 I moved as quickly as I could, outrunning the one unit of regulars and the cavalry I had. My game plan was to catch Bruce during deployment and try to bottle him up. I managed to get there with lots of time and had a quick tussle with one of his units and bagged it. Then I withdrew to lick my wounds. 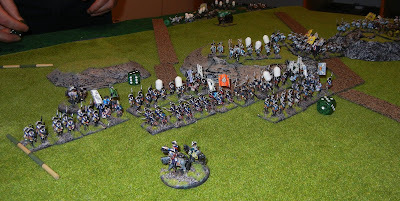 He mounted a cavalry charge which I managed to drive off, bagging three units. Melee in mass against rabble cavalry worked in my favour. I then lined up for the Scottish charge and took quite the beating coming into contact. Sneaky Brits kept shooting and then backing away! 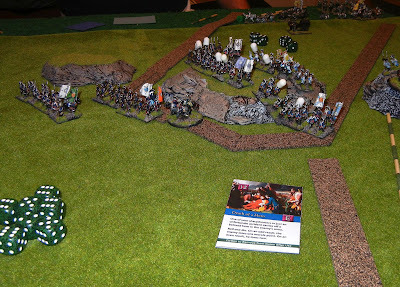 Eventually I dropped a piece of terrain behind them and managed to bag two units, and a third (while losing a couple). I managed to "win" by playing a "sharpshooter" card that I have been hording all game. Bruce was a pretty good sport about that! Overall, a great game. Deployment worked well, Bruce needed two lines because of the game mechanics so it looked like a "real" battle without any fiddly rules, there was a charge, a fall back, a rally and another charge. And the Scots played like Scots. 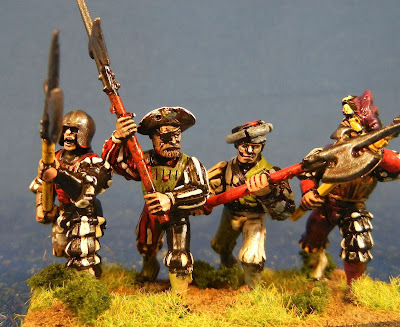 Up next: I have some 28mm renaissance under way and I'm planning my first Maurice game at the club next week, seeing if the rules will work for War of 1812. 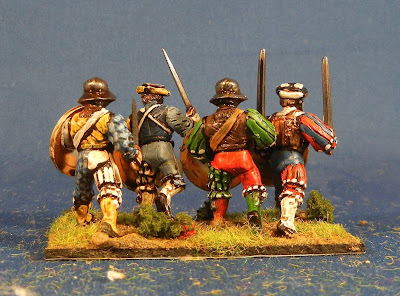 I've got two groups of 28mm renaissance figures on the go. I have some pike and sword fellows underway and they are turning out great. 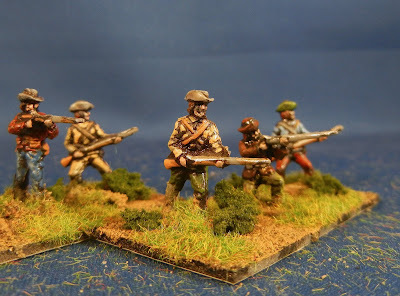 And then I have these 28mm archers which turned out terribly. I like to think I'm a pretty decent painter. But I guess I'm allowed to have an off day. 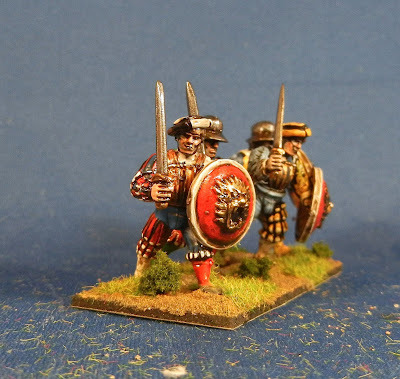 These are old GW sculpts (perhaps from the BattleMasters game). And then I appear to have chosen a terrible colour palette. And then executed it poorly. No idea what happened here. Oh, and I see I forgot to paint the jewel in the middle of their damned foreheads. I expect I will bin these guys shortly. Up next: Some delightful and newer GW empire sculpts which are turning our just fine, thank you. After that I will finish off some 1/72 AWI dragoons. We had a dozen guys out at the club last night. There were four guys playing Warmahordes, including newcomer Scott. I think we three guys named Scott our last night, almost beating our record of four Bruce's in one evening from 2008. 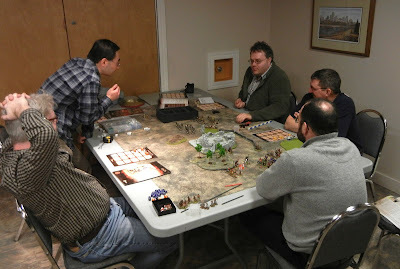 There were also five guys playing/watching Saga. I don't know what happened here but there was quite a post-game discussion of some unlikely die rolling that lead to the defeat of the Spanish "Normans" (Normandes?). Bruce hauled out a game of Maurice where we played with two guys per side (Bruce playing both hands of one side). You can see the set up below, with the Russians/Austrians in the foreground facing the Prussians (I think) across the battlefield. 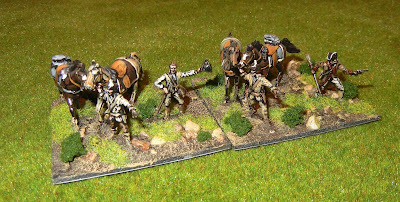 Bruce came forward with his right (foreground) and got stomped while a cavalry charge petered out on his left (background). He did, however, bag a bunch of cannon in the middle which put Guy and I in the soup somewhat. Note the reserve Russian infantry which has deployed in two lines on the right side, near the dice. Also note, on the far left behind the house Bruce's main attack readying its advance in column. Bruce then drove forward with his main attack and deployed in front of our lines and began grinding Guy's troops (Guy rolled amazingly well all night!). In the meantime, the reserve (by the trees in the picture below) has moved forward, passing over the bodies of our brave cannon crews and broken the centre of Bruce's line. At this point, both sides were within one unit loss of breaking. As Bruce pushed forward his grenadiers to snap up one of Guy's units, the reserves formed column, moved behind Bruce's line ("hey, whose that behind us, guv'n'r?") and was ready to charge Bruce in the rear. 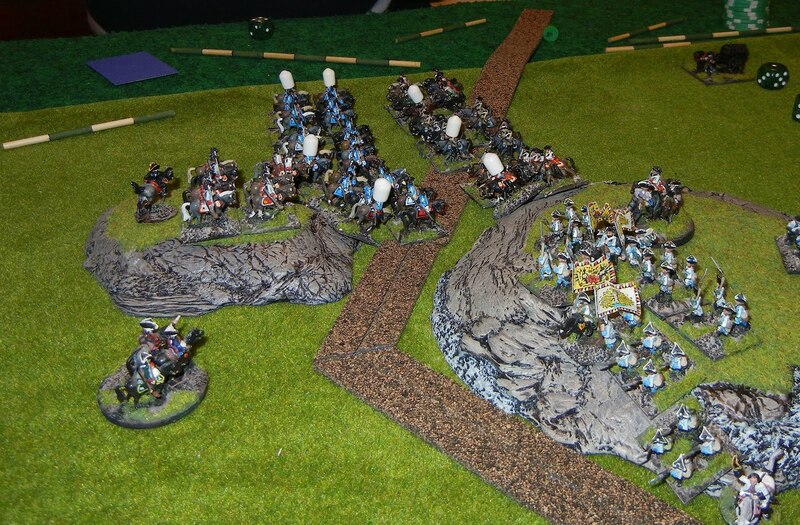 Pre-empting that, Bruce charges forward, taking and losing a unit at the same time. So we called the game a draw. All told, very dramatic. I'm now sure what it was like from Guy's and Bruce's perspectives, but I saw a reserve actually used to fill a hole in the line (it was ready even before the hole appeared), break an attack, get disordered, re-order and maneuver to outflank the main attack and turn the tide. Honestly, I've never see a game that allows you to do that! Up next: I'm painting some renaissance figures. 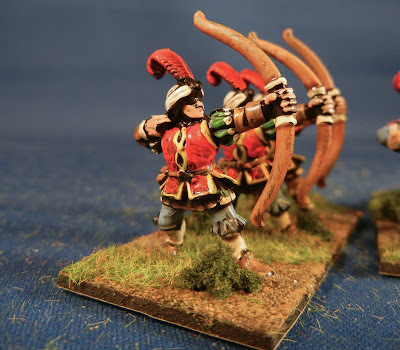 I have a bunch of 28mm archers done but they are, frankly, awful looking. I may just throw them out. I have a bunch of foot which are much better looking even though only half painted. Moving some dusty figure boxes about to locate unpainted figures, I ran across six War of 1812 figures that I'd previously painted but then based on 120mm frontages. 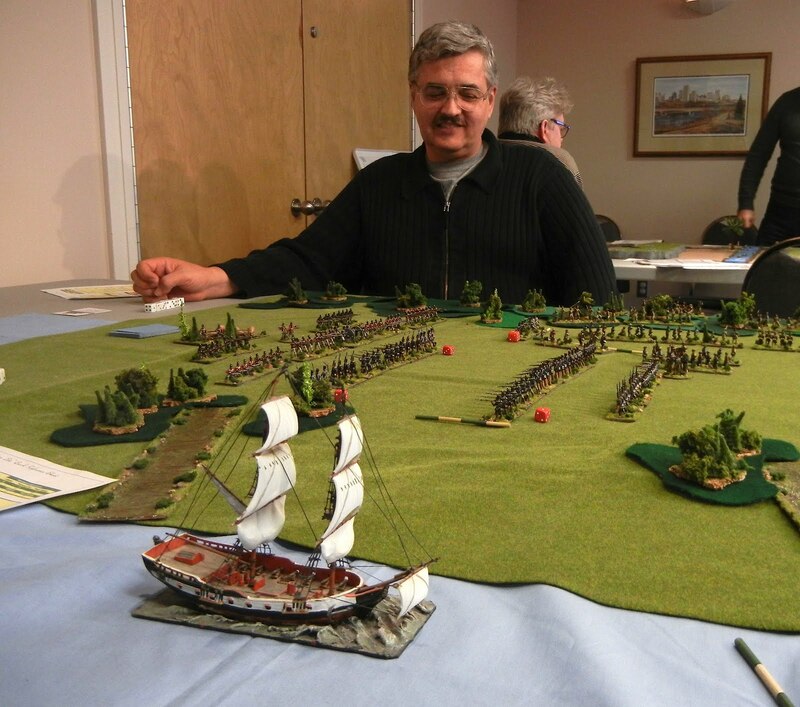 Perhaps I was dabbling with a War of 1812 version of Impetus? Anyhow I peeled them off the old base and put them on 60mm frontage for DHBx. These are old Airfix ACW figures (sculpted in the 1960s) which are fine for US militia in 1812. Up next: There is club night on Tuesday. I finished painting about 10 28mm renaissance archers yesterday--just need to touch up and base. I have some 1/72 AWI dragoon half painted and some more 28mm renaissance (halbred and sword) primered and ready to start. I finished up what I thought were the last of the 1/72 AWI this weekend (although I just discovered a few more that had fallen off the tray prior to priming). These are (I think) Imex figures that I got from Justin. 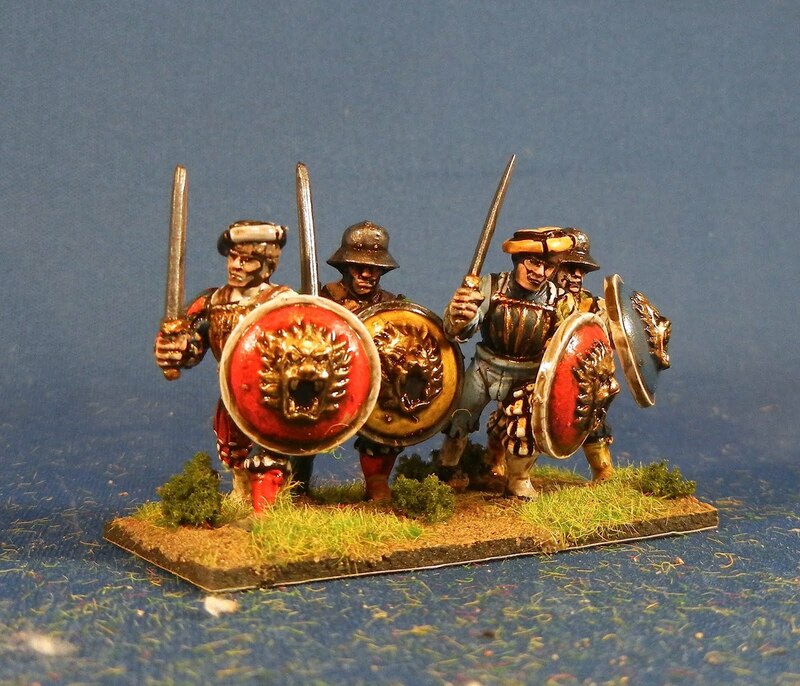 I've based them from DBHx on 60mm frontages but they would also work for Clash for a Continent. The painting shelf is starting to look nicely barren! The colour of the bare figures was an eye-searing red (as I assume for out-of-the-box play for kids against the blue American troops). Despite spraying with a good primer, I see that the red was not full covered and I'll need to go back and touch up. I so much prefer grey or buff coloured plastic! Up next: I have some 1/72 War of 1812 militia that I rebased. 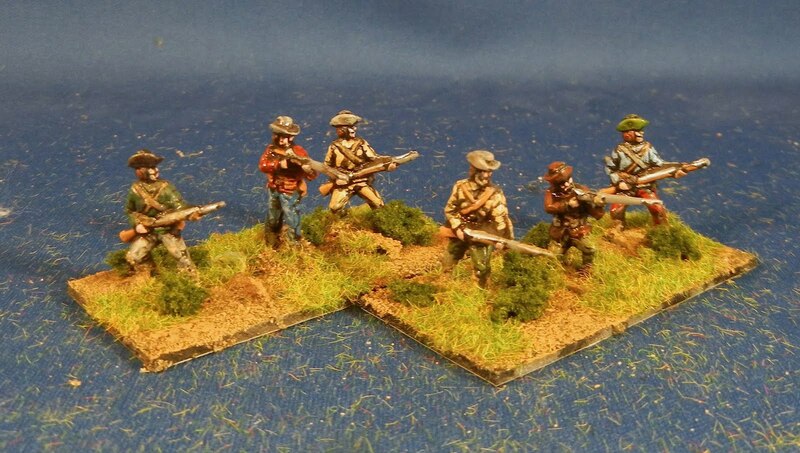 And some 1/72 British Dragoons underway. And I've just started on a batch of 40 28mm renaissance guys. I also have a commission incoming (Malifaux?) that I'm looking forward to seeing.